Add A Microfibre Noodle Pet Mat? The Henry Wag Raised Dog Bed combines contemporary design with strength and durability. The strong metal frame and firm base offers comfort and support and the detachable fabric cover can be wiped down or removed for convenient machine washing. The raised design ensures the dog is kept up off the floor away from drafts and allows for air circulation so eliminating the condensation and dampness often associated with traditional fabric beds. 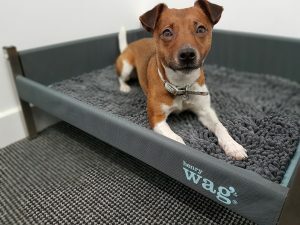 Why not add a microfibre noodle pet mat to fit your Henry Way raised dog bed? Available to fit sizes medium-xlarge, these luxurious microfibre Pet Noodle Mats from Henry Wag makes the perfect mat, removing dirt and water from your pet’s coat. It can be used as a bed liner, on the floor, in the car boot and as a towel. It absorbs more water and dries more quickly than regular towels.